Easycupcakes.com expects to have even more photos and step-by-step examples of lots of cupcake cakes soon. In the meantime, here are a few general tips for making cakes out of cupcakes. 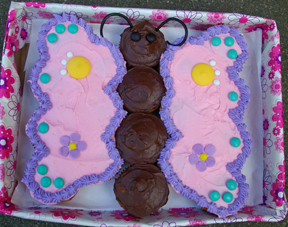 Scroll down to see a pretty butterfly cupcake cake and learn how to make it. Before you begin your cupcake cake, put down a foil-lined cake board or at least a sheet of stiff cardboard wrapped in aluminum foil. Cakes are hard enough to move, but when you have a cake with a wobbly base such as is the case with a cupcake cake, it’s even more important to have stability and transfer the goods as little as possible. It’s often a good idea to leave the cupcakes in their paper liners. It keeps them stable and even, and also it’s easier to stick them to the cake board. Once you’ve decided on the shape you’d like your cupcake cake to be, place the cupcakes close to one another, and then lift each one up and put a little big of icing on the bottoms of the cupcakes (or their liners) to adhere them to the base. There are several ways to frost a cupcake cake, and it depends on the “look” you’re going for. Some cupcake cakes are obviously made from cupcakes, and it’s intended to be noticed right away, such as with a line of cupcakes forming a caterpillar. However, other cupcake cakes are more subtle, and at first glance they look like a regular cake. If you want yours to look like a regular cake, visualize and treat the grouped cupcakes as a single unit. As you frost the cupcakes, sweep your knife or spatula over the cupcakes in one motion. Use thicker frosting rather than thin (from a can is fine) to be sure it will clear the “gaps” between the cupcakes OK. If you’re using a decorating bag, draw it all the way across the cake or perimeter in smooth motions. For the butterfly cake, I simply frosted four cupcakes with chocolate icing and placed them in a row. Then I staggered three cupcakes on each side, followed by four more on the other side of those. I used a wide icing tip with a pastry bag to place the frosting, which I then smoothed with a spatula. I used a star tip to edge around the wings, and then had fun adding candy designs. The antennae are licorice. Cupcake cakes are fun to make and a great twist that will be a hit at any party. You’ll have an original look as well as automatic portion control!